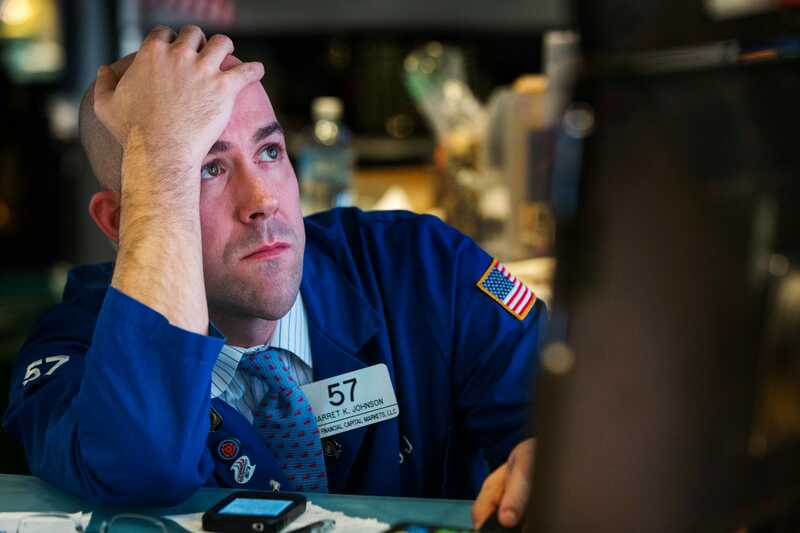 US stocks clawed higher after falling sharply early Thursday. The Wall Street Journal reported the Federal Reserve might adopt a wait-and-see approach to future policy decisions. Wall Street closed mixed Thursday as concerns about a cocktail of factors including trade tensions, Treasury yields, and energy prices weighed on global markets, extending losses for the Dow Jones Industrial Average and S&P 500 following the worst day for US equities in seven weeks. Stocks climbed back from sharp losses and the Nasdaq Composite turned positive Thursday afternoon after the Wall Street Journal reported that the Federal Reserve may adopt a wait-and-see approach to future policy decisions. The Dow shed 0.3%, or about 77 points. The Nasdaq rose 0.4%, and the S&P 500 was down 0.1%. The three main US indices had earlier lost more than 2% each. Stocks had suffered their worst day since October on Tuesday as expectations for a trade deal between Washington and Beijing unwound and after sections of the yield curve inverted. The stock market was closed Wednesday, a national day of mourning for former President George H.W. Bush, who died over the weekend. When futures trading resumed early Thursday, selling pressure was so strong in the first six minutes that CME Group was forced to intervene with market pauses to prevent severe price movements, according to Bloomberg. Canadian authorities on Wednesday evening confirmed the arrest of Meng Wanzhou, the chief financial officer of the Chinese cellular giant Huawei Technologies, on suspicion of violating US sanctions on Iran. The arrest, which happened Saturday, cast doubt on trade relations between Washington and Beijing, who agreed over the weekend to pause tariff escalations for negotiations. Optimism around the 90-day trade-war cease-fire has since waned, with President Donald Trump calling himself “a Tariff Man” in a tweet about Beijing. Treasury yields continued to slide Thursday, with the 10-year down 3.7 basis points to 2.886% and the two-year 5.3 basis points lower at 2.758%. Spreads between some long- and short-term bonds inverted this week, an occurrence seen as a potential recession signal, for the first time since the financial crisis. The dollar slipped 0.4% against the Japanese yen. Financials were among the biggest losers in Thursday’s sell-off. The KBW Bank Index fell into bear market territory, dragged lower by Citigroup (-3.5%) and JPMorgan Chase & Co (-2%). The S&P 500’s energy sector also slumped more than 2% as oil prices slipped further into a bear market. The OPEC cartel of oil producers reportedly reached an agreement to lower coordinated output levels Thursday, but was at odds with Russia over the amount. West Texas Intermediate dropped 2.4% to about $51.65 a barrel, and Brent fell to just above $60. Adding to concerns, the lens maker Largan Precision said its November revenue declined by more than a quarter from the same period a year earlier. Wall Street’s decline mirrored risk-off sentiment around the globe. The Stoxx 600 index closed down 3.3%, marking its worst day since Britain’s 2016 vote to leave the European Union. Markets in Asia were also lower, with the Nikkei 225 shedding 1.9% and the Shanghai Composite falling 1.7%.